The greatest songwriter of our time? 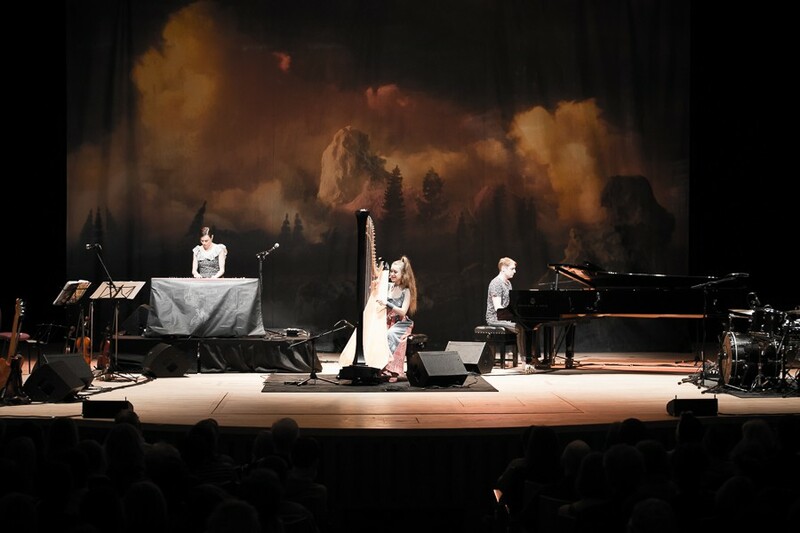 Getintothis’ Paul Higham finds Joanna Newsom worthy of even loftier title after a spellbinding Philharmonic show. As we get older, have been round the block a fair few times and endured more gigs than most have had hot dinners, you’d think there would be little left to astound and astonish this most cynically jaded reviewer. 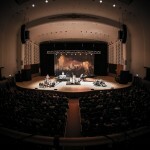 Yet tonight Joanna Newsom did that and more with an immeasurably perfect performance, fit to rank alongside the many who have graced the hallowed boards of Liverpool’s Philharmonic Hall before her. And this isn’t merely from a fanboy taking communion at the altar of long-worshipped deity. Newsom has a reputation for being divisive, difficult and niche. An artist to be respected certainly but, for many, hard to love. Cynical allusions to an affected and stilted presentation have proved difficult to shake off and prior performances, however good, have proved a test of patience. Tonight was different. This was the Eureka moment. A Damascene conversion in the space of a hypnotic, mesmeric and never short of jaw-dropping 90 minute performance. Yet it is difficult to pinpoint quite what had changed. 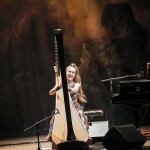 To a large extent this was the same Joanna Newsom that many have long-cherished. Indeed set-opener Bridges and Balloons from 2004’s The Milk-Eyed Mender took us right back to her gauche beginnings as one of the leading lights of the bourgeoning, if somewhat disparagingly titled, freak-folk movement. Did Freak Folk even exist and, if so, whatever happened to it? There was however a confidence and a maturity to her performance that felt far removed from those formative days. Indeed the evening’s defining characteristics were of restraint, poise and elegance. This wasn’t a play-until-your-fingers-bleed onslaught; it was more considered, more cerebral and, dare we say it, more grown-up. Perhaps the presence of her band – and what a band – helped to provide an effective rein on her wilder tendencies. Consequently much of the night felt underpinned by a gentle jazz influence, none more so than on Waltz of the 101st Lightborne which was the first to be performed solely on piano. There was a malleable looseness about the arrangements that felt nothing short of addictive. Yet this wasn’t safe easy listening. Far from it. There remained a sense of daring and unpredictability throughout and, whether at the harp or behind the piano, Newsom remained entirely compulsive viewing. Early set pleaser Monkey & Bear exemplified this. Built around a heady fusion of Newsom‘s blurred fingers and a cacophony of afro-beat rhythmic textures, at times it recalled desert-blues as her voice added texture and depth. It is that very voice at which Newsom‘s critics have often taken aim. Yet it is clear she knows how to use it as a constructive weapon. Acting as the vehicle for some of music’s most inventive and enigmatic lyrics, it also works as an instrument in its own right, twisting and turning through a bewildering range of timbre and pitch. Where in the past its breathlessness has resulted in lyrics passing by in a daze, tonight it revealed subtle depths adding poignancy and fragility as well as allowing the sense of invention on, for example, Have One on Me to shine through. Elsewhere there was a country soul feel, demonstrating an increased variety and emotion, with the mask on occasions slipping to reveal a fragile vulnerability as the passing of time and transience of existence proved enduring lyrical themes. In a career-spanning set, what was most evident was the renewed sense of energy imparted by latest release Divers, her first since 2010’s Have One On Me. Much like the new album, there was a lightness, sprightliness and vibrancy throughout. While still offering a technical masterclass, the over-earnestness of yore was replaced by a more laid-back and relaxed manner, without ever diminishing its art. The result? Spellbinding magnificence. 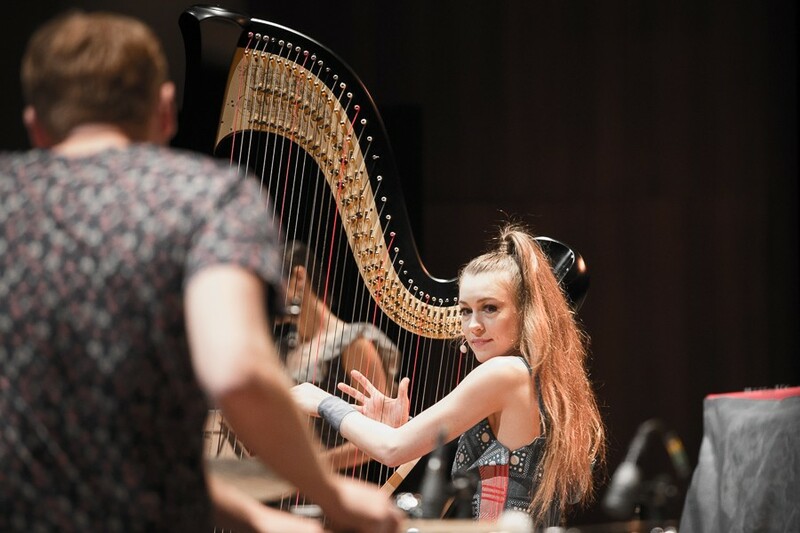 It speaks volumes of the esteem in which Joanna Newsom is held that a Fleet Fox would be invited to act as support – and indeed be willing to accept. 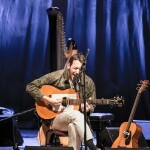 Robin Pecknold took to the stage in an unassuming manner as if not to steal the limelight from the night’s headliner. Yet there was little danger of him doing so. 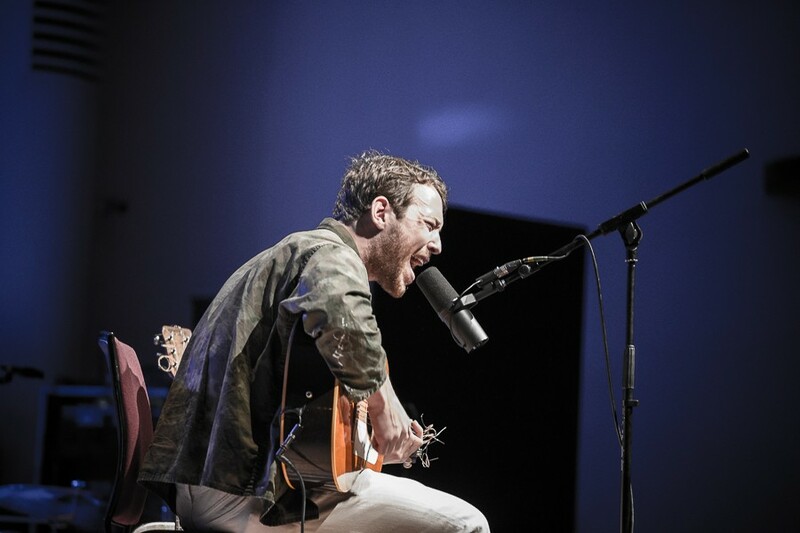 Perched cross-legged on a stool with acoustic guitar, Pecknold was a study in beige blandness. Armed with a terrific voice it is a pity his songs seem incapable of doing it justice. Perhaps his voice is also the problem, too pure and not lived in enough it struggles to anchor any genuine emotion in the songs. The result being that they wash over. Pleasant and mildly diverting yes, but it is fair to say that we were expecting more. Things did improve as the short set reached its climax. 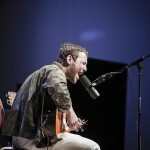 Perhaps this was on account of familiarity as some Fleet Foxes big guns, Tiger Mountain Peasant Song and Montezuma, were pulled out of the bag, drawing spontaneous applause from the respectful audience. 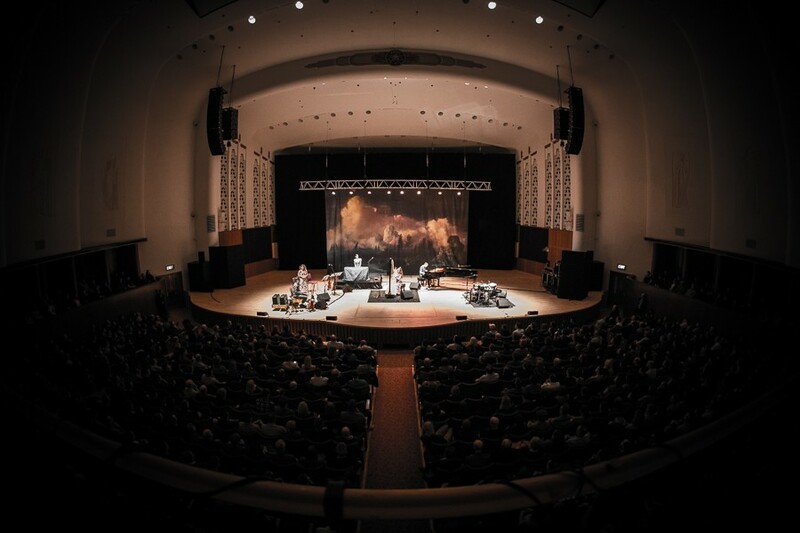 It was clear that many in attendance were delighted by the set yet the nagging feeling remains that Fleet Foxes are little more than watered-down imitators of a more authentic scene. 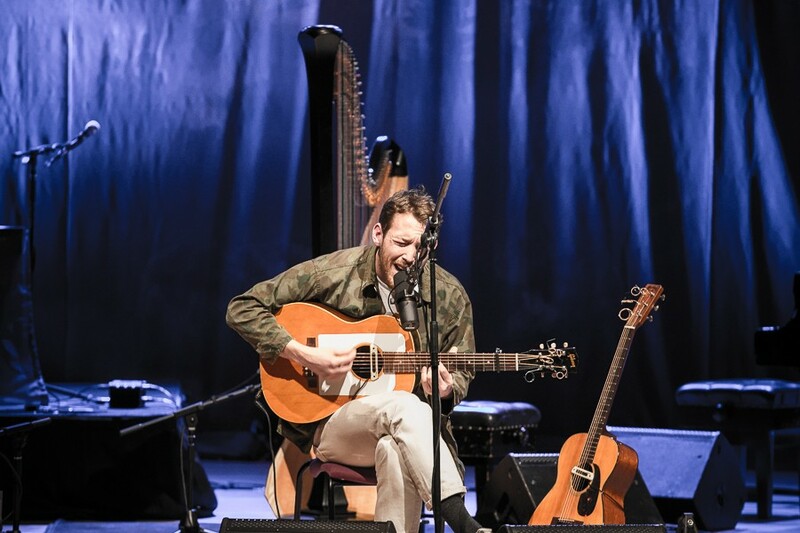 Such charges could not be levelled at Newsom and when taking to the stage, Robin Pecknold, in his unassuming and ever so humble manner, proclaimed Joanna Newsom as the greatest songwriter of our time. We’d beg to disagree. For Pecknold is surely downplaying her talents as a performer and as an arranger. 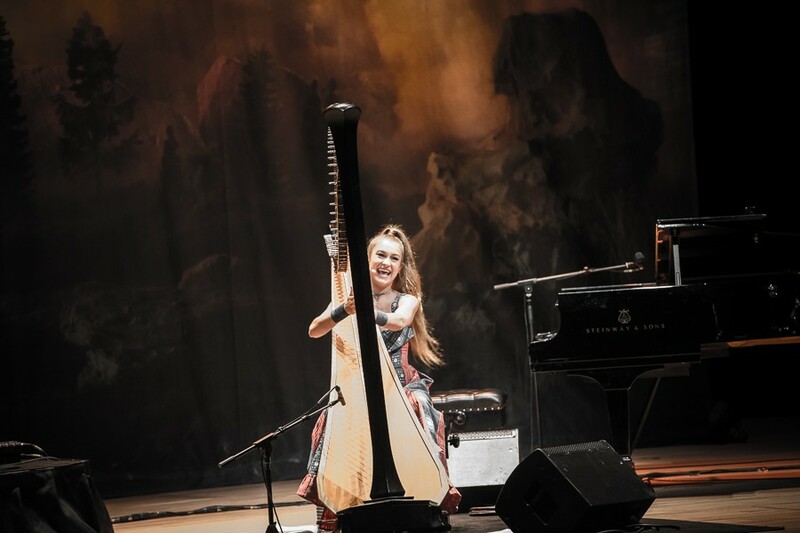 Joanna Newsom befits any time and stands worthy comparison with all, however mighty, who have come before. And to witness her in full flight, well it is a blessing and a privilege.